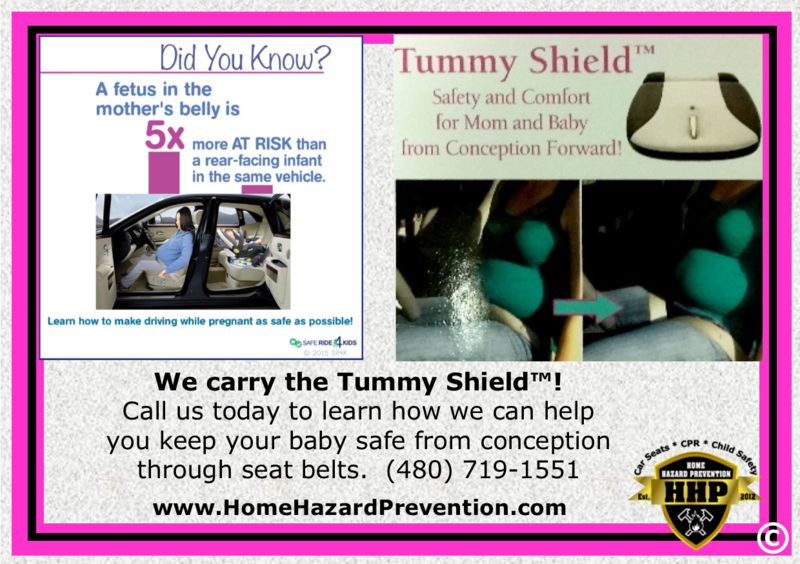 The Tummy Shield can protect both the pregnant mother and her baby during her pregnancy. Good morning friends. We have a special guest article this week. Amie Durocher has been a certified CPS Technician since 2004. She is the Creative Director at Safe Ride 4 Kids, a company that offers up-to-date car safety information and innovative products, like the Tummy Shield, to help parents keep their precious little ones safe. It’s an exciting time. You are about to be a parent. You have a lot of learning to do to have a healthy and safe pregnancy and baby. You have a lot of preparations to make. You know once that baby is born, you can’t drive anywhere without safely buckling in your baby into a car seat. And, of course you will because you want to protect your baby no matter what. But what about during pregnancy, are you keeping your baby safe in the car now? Did you know that the fetus of a pregnant woman has been shown to be at five times the risk of a 0 to 1 year old infant in the same car using standard, mandated restraint systems? You are required by law to protect your infant, buckling her into properly installed a rear-facing child restraint. Are you required by love to protect the baby in your womb? Recent studies predict anywhere from 700 to 5,000 pregnancies are lost every year due to motor vehicle crashes. Even on the low end, that is almost six times the average of 120 infants who die in car crashes every year. That’s an incredible figure. On the high end; WOW. Just WOW! At this point you may be asking why is it such a wide range? The reason it’s hard to tell is because miscarriage occurs in 10-20% of all pregnancies during the first trimester. And only deaths to fetuses more than 20 weeks gestational age are legally defined and required to be recorded. Sometimes a pregnant women is in a minor “fender bender” and doesn’t miscarry the baby until weeks later and the connection is never made. According to former Director of the Office of Crashworthiness at National Highway Traffic Safety Administration (NHTSA) Jim Hoffrberth, it has been known for about 50 years that seat belts were not optimally designed for keeping pregnant women and their babies safe. But the design worked for most of the rest of the population and at that time pregnant women just weren’t in the car that much. More recently, a study by the University of Michigan estimates that about 170,000 car crashes in the U.S. each year involve pregnant women. On average, 2.9% of women report being hurt in a “car accident” during pregnancy. Based on an average of 4 million babies born a year, that’s 116,000 crashes where a pregnant woman is injured, at least somewhat, every year. Do you want to put the odds in your favor? • Gauge how you feel. If you are feeling tired, sick or otherwise out of sorts, eat a snack, drink some water or take a rest. Wait to drive until you feel better. • Be a passenger. When possible, don’t drive, especially as your pregnancy progresses and your uterus gets closer and closer to the steering wheel. • Position your seat as far back from the steering wheel as comfortable. Try to have at least 10 inches from the steering wheel. • Buckle up correctly. NHTSA recommends that pregnant women wear their safety belt with the lap portion placed under the abdomen and across the upper thighs, as low as possible on the hips and the shoulder strap runs across your chest. • If you use a maternity seat belt positioning device make sure it has been well designed and crash tested for safety and that it is not just for comfort. There is one such device called the Tummy Shield that is highly engineered and crash tested which redirects the lap portion of the seat belt away from the abdomen, creating leg harness, much like a race car driver’s seat belt. Crash testing shows the Tummy Shield restrains the woman at least as well as just the seat belt while protecting the abdomen from possible injury from the seat belt going across the belly. For additional tips, Safe Ride 4 Kids has a downloadable guide about safe driving during pregnancy. Amie Durocher has been a certified CPS Technician since 2004. She is the Creative Director at Safe Ride 4 Kids, a company that offers up-to-date car safety information and innovative products, like the Tummy Shield, to help parents keep their precious little ones safe.